Mahalanobis, the founder of ISI, was deeply influenced by wisdom and guidance of Rabindranath Tagore and Brajendranath Seal. Under his leadership, the institute initiated and promoted the interaction of Statistics with natural and social sciences to advance the role of Statistics as a key technology by explicating the twin aspects – its general applicability and its dependence on other disciplines for its own development. The institute is now considered as one of the foremost centres in the world for training and research in Computer science, Statistics, Quantitative Economics and related sciences. Key areas of expertise of ISI are Computer science, Statistics, Mathematics, Mathematical economics, Operations Research and Information Science and it is one of the few research oriented Indian schools offering courses at both the undergraduate and graduate level. ISI's origin can be traced back to the Statistical Laboratory in Presidency College, Kolkata set up by Mahalanobis, who worked in the Physics Department of the college in the 1920s. During 1913–15, he did his Tripos in Mathematics and Physics at University of Cambridge, where he came across Biometrika, a journal of Statistics founded by Karl Pearson. Since 1915, he taught Physics at Presidency College, but his interest in Statistics grew under the guidance of polymath Brajendranath Seal. Many colleagues of Mahalanobis took an interest in Statistics and the group grew in the Statistical Laboratory. Considering the extensive application of Statistics in solving various problems in real life such as analyzing multivariate anthropometric data, applying sample surveys as a method of data collection, analyzing meteorological data, estimating crop yield etc., this group, particularly, Mahalanobis and his younger colleagues S. S. Bose and H. C. Sinha felt the necessity of forming a specialized institute to facilitate research and learning of Statistics. In 1931, Mahalanobis was the only person working at ISI, and he managed it with an annual expenditure of Rs.250. It gradually grew with the pioneering work of a group of his colleagues including S. S. Bose, Samarendra Kumar Mitra (Head of the Computing Machines and Electronics Laboratory and designer of India's first computer), J. M. Sengupta, Raj Chandra Bose, Samarendra Nath Roy, K. R. Nair, R. R. Bahadur, Gopinath Kallianpur, D. B. Lahiri, and Anil Kumar Gain. Pitamber Pant, who had received training in Statistics at the institute, went on to become a secretary to the first Prime Minister of India, Jawaharlal Nehru, and was a great source of help and support to the institute. The institute started a training section in 1938. In due course, many of the early workers left the ISI for careers in the USA or for positions in public/private sector in India. By the 1940s, the ISI was internationally known and was taken as a model when the first institute of Statistics was set up in the United States by Gertrude Cox – perhaps the only time an institute in a developing country was used as a model in a developed country. Until 1959, ISI was associated with the University of Calcutta. By 'The Indian Statistical Institute Act 1959' of the Parliament of India, amended in 1995, ISI was declared an institute of national importance, and was authorised to hold examinations and to grant degrees and diplomas in Statistics, Mathematics, Computer Science, Quantitative Economics, and in any other subject related to Statistics as identified by the Institute from time to time. ISI is a public university, as the same act also states that ISI would be funded by the Central Government of India. ISI functions as an autonomous institute under the Ministry of Statistics and Programme Implementation (MOSPI), which is the nodal ministry of the Government of India that ensures the functioning of ISI in accordance with The Indian Statistical Institute Act 1959. ISI Council is the highest policy–making body of the institute. Members of this council include the President of ISI, the Chairman of ISI, representatives of the Government of India including one representative of RBI, scientists not employed in ISI including one representative from the Planning Commission of India and one representative of the UGC, representatives of scientific and non-scientific workers of ISI, and representative from academic staff of ISI, including the Director of ISI and the Dean of Studies of ISI. Bimal Kumar Roy was the Director until 10 June 2015; in a move unique in the history of the Institute, he was removed from his post via a notice posted on the web site of the Ministry of Statistics and Planning. The major objectives of the ISI are to facilitate research and training of Statistics, to indulge in development of statistical theory and in application of statistical techniques – in the scenarios of planning at national level and in theoretical development of natural and social sciences, to participate in the process of data collection and analysis, to operate related projects in planning and improvement of efficiency of management and production. The Sanskrit phrase भिन्नेष्वैक्यस्य दर्शणम् (Bhinneswaykyasya Darshanam), which literally means the philosophy of unity in diversity, is incorporated in the logo of the institute, and is the motto of ISI. Traditionally, ISI offers fewer programs (and admits fewer students) than most other degree granting academic institutions. Following the empowerment for granting degrees in the subject of Statistics as per the ISI Act 1959, in 1960, ISI initiated bachelor level degree program Bachelor of Statistics and master level degree course Master of Statistics, and also began awarding research level degrees such as PhD and DSc. Later, ISI started offering Master of Technology (MTech) courses in Computer Science and in Quality, Reliability & Operations Research (QR&OR); these courses got recognition from All India Council for Technical Education (AICTE). As ISI Act of 1959 was amended by the Parliament of India in 1995, ISI was empowered to confer degrees and diplomas in subjects such as Mathematics, Quantitative Economics, Computer Science, and other subjects related to Statistics and Operations Research as determined by ISI from time to time. Apart from the degree courses, ISI offers few diploma and certificate courses, special diploma courses for international students via ISEC, and special courses in collaboration with CSO for training probationary officers of Indian Statistical Service (ISS). ISI offers two undergraduate programs, viz. Bachelor of Statistics (Honours) (B.Stat) and Bachelor of Mathematics (Honours) (B. Math), seven graduate programs, viz. Master of Statistics (M. Stat), Master of Mathematics (M. Math), Master of Science in Quantitative Economics (MSQE), Master of Science in Library and Information Science (MSLIS), Master of Science in Quality Management Science (MSQMS), Master of Technology in Computer Science (MTech–CS) and Master of Technology in Quality, Reliability and Operations Research (MTech–QROR), three PG Diploma programs, viz Post Graduate Diploma in Computer Applications (PGDCA) and P.G. Diploma in Statistical Methods and Analytics and research fellowships towards obtaining a PhD degree. The third PG diploma program being in collaboration with IIM Calcutta and IIT Kharagpur - Post Graduate Diploma in Business Analytics (PGDBA) with an aim to nurture and develop highly skilled business analytical professionals. Applicants of all degree courses are required to go through written admission tests and interviews. ISI conducts the written tests at various examination centres across India. Only in few cases, candidates may get called for the interview directly, viz. applicants of MTech Computer Science course having a GATE score above a threshold. Candidates applying to doctoral research programmes who have been awarded (or qualified for) a Junior Research Fellowship by UGC / CSIR / NBHM etc are also required to clear the ISI JRF admission test or an equivalent separate test and interview conducted by the relevant JRF selection committee of the institute if they wish to obtain a Ph.D from Indian Statistical Institute. Sankhya, the statistical journal published by ISI, was founded in 1933, along the lines of Karl Pearson's Biometrika. Mahalanobis was the founder editor. Each volume of Sankhya consists of four issues; two of them are in Series A, containing articles on theoretical statistics, probability theory and stochastic processes, and the other two issues form the Series B, containing articles on applied statistics, i.e. applied probability, applied stochastic processes, econometrics and statistical computing. According to India Education Review, no Indian university is in the world's top 200 universities. The ascribed ranking of ISI is 386. The web ranking of this institute, according to 4ICU (4 International Colleges and Universities), is 1693. According to the web ranking published by Webometrics Ranking of World Universities, ISI currently holds the world rank of 1352. In the subject-wise academic world ranking of Computer Science, Indian Statistical Institute features in 101—150 category. 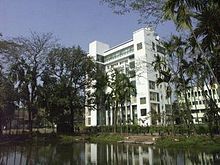 The Indian Statistical Institute, Kolkata is ranked 2nd in Computer Science research by mean citation rate, p-Index, h-index among all universities in India. Over the years, researchers of ISI made fundamental contributions in various fields of Statistics such as Design of Experiments, Sample Survey, Multivariate statistics and Computer Science. Mahalanobis introduced the measure Mahalanobis distance which is used in multivariate statistics and other related fields. Raj Chandra Bose, who is known for his contributions in coding theory, worked on Design of Experiments during his tenure at ISI, and was one of the three mathematicians, who disproved Euler's conjecture on orthogonal Latin squares. Anil Kumar Bhattacharya is credited with introduction of the measures Bhattacharyya distance and Bhattacharya coefficient. Samarendra Nath Roy is known for his pioneering contributions in multivariate statistics. Among colleagues of Mahalanobis, other notable contributors were K. R. Nair in Design of experiments, Jitendra Mohan Sengupta in Sample Survey, Ajit Dasgupta in Demography and Ramkrishna Mukherjea in Quantitative Sociology. C. R. Rao's contributions during his association with ISI include two theorems of Statistical Inference known as Cramér–Rao inequality and Rao-Blackwell Theorem, and introduction of orthogonal arrays in Design of Experiments. Anil Kumar Gain is known for his contributions to the Pearson product-moment correlation coefficient with his colleague Sir Ronald Fisher at the University of Cambridge. In 1953, India's first indigenous computer was designed by Samarendra Kumar Mitra who headed the Computing Machines and Electronics Laboratory at ISI Calcutta. The Indian Statistical Institute was also hosted the first two digital computers in South Asia; the HEC-2M from England in 1956, and the URAL from the Soviet Union in 1959. These were also among the earliest digital computers in Asia (outside Japan). During 1953 - 1956 distinguished scientists, like Ronald Fisher, Norbert Wiener and Yuri Linnik visited ISI. Norbert Wiener collaborated with Gopinath Kallianpur on topics including ergodic theory, prediction theory and generalized harmonic analysis. In 1962, during his month-long visit to ISI, Soviet mathematician Andrey Kolmogorov wrote his notable paper on Kolmogorov complexity, which was published in Sankhya, 1963. Other distinguished scientists including Jerzy Neyman, Walter A. Shewhart, W. Edwards Deming and Abraham Wald have visited ISI during the tenure of P. C. Mahalanobis. In India, the first analog computer was designed by Samarendra Kumar Mitra and built by Ashish Kumar Maity at ISI in 1953, for use in computation of numerical solutions of simultaneous linear equations using a modified version of Gauss-Siedel iteration. In 1955, the first digital computer of India was procured by ISI. This machine was of a model named HEC-2M, manufactured by British Tabulating Machine Company (BTM). As per the agreement with BTM, ISI had to take care of the installation work and maintenance of it, before it became operational in 1956. Though this HEC-2M machine and the URAL-1 machine, which was bought in 1959 from Russia, were operational till 1963, ISI began development of the first second-generation digital computer of India in collaboration with Jadavpur University (JU). This joint collaboration led by the head of the Computing Machines and Electronics Laboratory at ISI, Samarendra Kumar Mitra, produced the transistor-driven machine ISIJU-1, which became operational in 1964. The first annual convention of the Computer Society of India (CSI) was hosted by ISI in 1965. The Computer and Communication Sciences division of ISI produced many eminent scientists such as Samarendra Kumar Mitra (its original founder), Dwijesh Dutta Majumdar, Sankar Kumar Pal, Bidyut Baran Chaudhuri, Nikhil R. Pal, Bhabani P. Sinha, Bhargab B. Bhattacharya, Malay K. Kundu, Sushmita Mitra, Bhabatosh Chanda, C. A. Murthy, Sanghamitra Bandyopadhyay and many. ISI is regarded as one of the top most centres for research in computer science in India and attracts some of the best students in the country. The Knowledge-based Computer Systems project (KBCS), funded jointly by Department of Electronics and Information Technology (DoE), Government of India and UNDP since 1986, has a nodal centre at ISI Kolkata. This unit is responsible for research in the area of image processing, pattern recognition, computer vision and artificial intelligence. The institute has done some pioneering work and research in anthropology and palaeontology. A trove of dinosaur fossils was discovered by a team led by ISI researchers in the early 1960s. The scattered fossils were recovered and the partial skeleton was reconstructed at ISI's Baranagar campus. It turned out to be a unique species and was named the Barapasaurus tagorei (Dinosauria: Sauropoda), after Rabindranath Tagore and was mounted in the Geology Museum at the Kolkata Campus of the Institute. Many students and research scholars of ISI pursued a career in academics, and have excelled in the fields of statistics, mathematics, probability theory, computer science and economics. In statistics alumni of ISI who have been elected a Fellow of the American Statistical Association include P. V. Sukhatme (1950) and K. R. Nair (1951). There are many other notable ones including Samarendra Kumar Mitra, S. R. S. Varadhan, Debabrata Basu, K. R. Parthasarathy, Jayanta Kumar Ghosh, Bimal K. Roy, Sankar Kumar Pal, B. L. S. Prakasa Rao, G. Jogesh Babu, Thiruvenkatachari Parthasarathy, Gopinath Kallianpur, Rajeeva Karandikar, Ravindra Khattree, Sanghamitra Bandyopadhyay, Palash Sarkar, J. S. Rao, Kesar Singh, Ranajit Chakraborty, Partha Pratim Majumder, Probal Chaudhuri, Arup Bose, Debashish Goswami, Ritabrata Munshi, Sourav Chatterjee, Jean Drèze, Sucharit Sarkar. ISI alumni notable for non-academic career include politicians Subramanian Swamy and Dipankar Bhattacharya. Soviet premier Nikita Khrushchev visited ISI during his visit to India in 1955. Zhou Enlai, the Prime Minister of China, and Ho Chi Minh, the President of Vietnam, during their visit to India specifically visited ISI respectively on 9 September 1956 and 13 February 1958. Since mid-forties, ISI pioneered in research and application of Statistical Quality Control (SQC) in India. Walter A. Shewhart, the statistician known as the father of SQC, and other experts of this field visited ISI over the years. The first Statistical Quality Control and Operations Research (SQC & OR) unit of ISI was set up in Mumbai in 1953, followed by Bangalore and Kolkata units in 1954. In 1976, this unit was transformed into the SQC & OR Division, which now operates eight units, located at various industrial centres in India – Kolkata, Delhi, Bangalore, Chennai, Pune, Mumbai, Coimbatore and Vadodara. These units partake in technical consultancy with public and private organisations, in addition with performing research and training activities. The Kolkata campus offers bachelors level degree course in Statistics (B. Stat), master's degree course in Statistics (M.Stat), Mathematics (M.Math), Computer Science (MTech), Quality Reliability and Operations Research (MTech) and Quantitative Economics (M.S.). Major divisions and units are: Statistics and Mathematics Unit (SMU), Human Genetics Unit (HGU), Physics and Applied Mathematics Unit (PAMU), Geological Studies Unit (GSU), Advanced Computation and MicroElectronics Unit (ACMU), Computer Vision and Pattern Recognition Unit (CVPRU), Machine Intelligence Unit (MIU), Electronics and Communication Sciences Unit (ECSU), Applied Statistics Unit (ASU), Economic Research Unit (ERU), Linguistic Research Unit (LRU), Sociology Research Unit (SRU), Psychometry Research Unit (PRU) and Population Studies Unit (PSU). The Bangalore Centre of ISI started with a Statistical Quality Control and Operations Research (SQC&OR) unit in 1954. The Documentation Research and Training Centre (DRTC) here became operational from 1962 with honorary professor S. R. Ranganathan as the head. Prof. Mahalanobis planned of starting a full-fledged centre of ISI here around the mid-sixties. In 1966, the then Government of Karnataka granted ISI 30 acres of forest land full of eucalyptus trees, next to the upcoming campus of the Bangalore University, located on the Mysore Road on the outskirts of the city. However, after death of Prof. Mahalanobis in 1972, the project of establishing Bangalore centre got temporarily shelved. The project was again revived during 1976–78. Concrete proposals were made to the Government of India to get grants for the development of the land already in possession of ISI, along with the construction of an academic block with a library and offices. In the meantime, a building was rented on Church Street, in Bangalore downtown, and various activities of the Bangalore Centre started in September 1978. The Economic Analysis Unit (EAU) and the Statistics and Mathematics Unit (SMU) were established. The SQC&OR Unit and the DRTC unit, which were functioning from other rented buildings at that time, joined this new Centre. As construction of the administrative block at the new campus got completed, the various units moved to the new campus in May 1985. The sprawling green wooded Campus has Residential Facility for students, faculty and staff. The Bangalore centre was formally declared as a centre of ISI in September 1996. Integration is the annual techno-cultural fest of Indian Statistical Institute, usually held during the first and second weekend of January each year. It is one of the biggest student fests in Kolkata, and attracts participation from all over the world.Also the performances of great artists are always a center of attraction for all. Alumni of ISI – including recipients of PhD degree – are employed in government and semi–government departments, industrial establishments, research institutions, in India and other countries. There is a placement cell in ISI Kolkata that organizes campus interviews by prospective employers in various campuses of ISI. Since recent past, a high percentage of ISI alumni gets absorbed into jobs in analytics, banking, finance and software industry. ^ a b Ghosh, JK (1994). "Mahalanobis and the Art and Science of Statistics: The Early Days". Indian Journal of History of Science. 29 (1): 90. ^ a b c d Rao, C. R (1973). Prasantha Chandra Mahalanobis. 1893–1972. 19. Biographical Memoirs of Fellows of the Royal Society. pp. 454–492. ^ a b Rudra, A (1996). Prasanta Chandra Mahalanobis: A Biography. Oxford University Press. ^ Dronamraju, Krishna R. (1987). "On Some Aspects of the Life and Work of John Burdon Sanderson Haldane, F.R.S., in India". Notes and Records of the Royal Society of London. 41 (2): 211–237. doi:10.1098/rsnr.1987.0006. PMID 11622022. ^ "Pranab Mukherjee inaugurates Chennai centre of Indian Statistical Institute". The Hindu. 27 July 2008. Retrieved 1 October 2008. ^ "New life for Look East policy with Tezpur ISI". The Times of India, Guwahati Edition. 24 July 2011. Retrieved 13 November 2012. ^ a b "Office Bearers". Indian Statistical Institute. Retrieved 15 December 2012. ^ "Termination Letter" (PDF). Ministry of Statistics and Planning. Archived from the original (PDF) on 14 June 2015. Retrieved 10 June 2015. ^ a b "Welcome to Indian Statistical Institute, Kolkata". www.isical.ac.in. ^ a b c d e f g h i j k "Prospectus, 2012–13" (PDF). Indian Statistical Institute. Retrieved 1 December 2012. ^ a b c d e f "Academic Programme". Indian Statistical Institute. Retrieved 13 November 2012. ^ "PGDCA Programme" (PDF). Indian Statistical Institute. Retrieved 26 June 2016. ^ "No Indian university in world's top 200: QS Rankings 2012". India Education Review. 12 September 2012. Archived from the original on 10 October 2012. Retrieved 18 November 2012. ^ "India – Ranking Web Universities". Webometrics. Retrieved 31 July 2018. ^ "Academic Ranking of World Universities in Computer Science - 2015 - 2015 Top 200 Universities in Computer Science - ARWU-SUBJECT 2015". www.shanghairanking.com. ^ "Ranking of Indian Institutions Contributing to Computer Science Research, 1999-2008" (PDF). ^ Menon, Nikhil (2018). "'Fancy Calculating Machine': Computers and planning in independent India". Modern Asian Studies. 52 (2): 421–457. doi:10.1017/S0026749X16000135. ^ Das, Gurcharan (2002). India Unbound From Independence to the Global Information Age. Penguin Books. p. 88. ISBN 9780143063018. ^ a b c "50 Years of IT: Disrupting Moments: 1956–1965: The Beginning". Dataquest magazine, India. 30 December 2006. Archived from the original on 21 January 2013. Retrieved 18 November 2012. ^ Utpal Kumar Bannerjee (1 January 1996). Computer Education in India: Past, Present and Future. Concept Publishing Company. p. 248. ISBN 9788170226093. Retrieved 16 November 2012. ^ "Đorđe Kostić". Institute for Experimental Phonetics and Speech Pathology, Belgrade. Archived from the original on 28 September 2014. Retrieved 30 November 2012. ^ Naithani, Pankaj. "Remembering Prasanta Chandra Mahalanobis". The Mainstream weekly. Retrieved 25 July 2009. ^ Wedeworth, Robert (1993). World Encyclopedia of Library and Information Services (3 ed.). American Library Association. p. 697. ISBN 9780838906095. Retrieved 23 December 2012. ^ Bano, Rahat (17 November 2009). "The number crunchers". The Hindustan Times. Archived from the original on 17 April 2014. Retrieved 15 December 2012. Ghosh, J. K.; Maiti, P.; Rao, T.J.; Sinha, B.K. (April 1999). "Evolution of Statistics in India" (PDF). International Statistical Review. 67 (1): 13–34. doi:10.1111/j.1751-5823.1999.tb00378.x. Archived from the original (PDF) on 10 August 2013. Ghosh, Jayanta; Maiti, Pulakesh; Bera, Anil (2010). "Indian Statistical Institute: Numbers and Beyond, 1931–47 (chapter 33)". In Dasgupta, Uma (ed.). Science and Modern India: An Institutional History, C. 1784–1947. Pearson Education India. ISBN 978-8131728185. Retrieved 9 December 2012. Wikimedia Commons has media related to Indian Statistical Institute, Kolkata.